Bulk copies of Understanding MMS: Conversations with Jim Humble, are now a reality. I received the first shipment yesterday, promptly filling orders for over 400, with another 300 shipped today. The packet sizes are 10, 25, 50, 100, and 150, and unit price range is from $6.50 (for 10) each to $3.33 each (for 150). Price includes nothing but the disc. I can stock paper sleeves that can be ordered and included for a nominal price. That’s easy enough to do. But this now makes it feasible for individuals or organizations to purchase a quantity of the documentary, to give to loved ones they want to be informed, or to people within a community, who can benefit by this understanding. 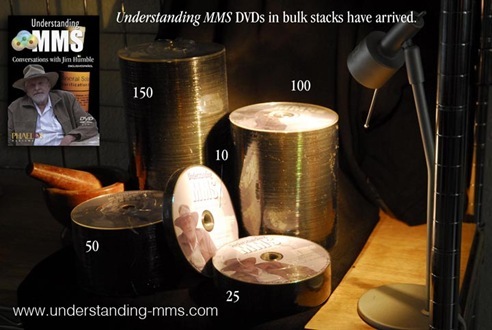 Some MMS vendors will include the DVD in product sales that reach a certain price point. Clinics and practitioners can disseminate the video to help educate their clients. A more knowledgeable individual will be a healthier individual. This is new territory for me as far as information sharing is concerned. I may, or may not have the bundle you order in stock, but it only takes two weeks to manufacture, so please allow three weeks delivery. As we have more experience, we’ll have adequate quantities of various bundles in stock for immediate shipping. Thanks again to David C. for the suggestion. might want to check this out bruce making more accusations against jim humble. you might want to check this out bruce is making more claims against jim humble on this site. Adam, you are very welcome! Hope that this is a best seller and that it will really get the word out to the masses! I truly believe that MMS may be the greatest discovery since Royal Raymond Rife’s Universal Microscope and his Rife Machine that killed cancer and other viruses with specific radio frequency.